When I heard the sound of the Liemba’s horn, I was in that in-between state when one is neither fully awake nor fully asleep. 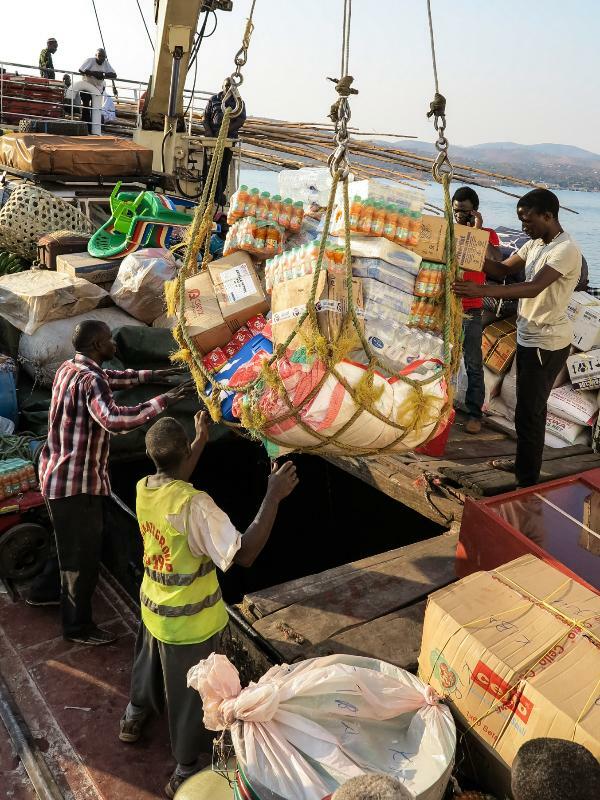 For a while I wasn’t sure whether I was dreaming, but when I felt the vibration of the anchor’s chain I knew I was awake: The MV Liemba was having its first stop. Originally called the Graf von Goetzen, the Liemba was one of three vessels the German Empire used to control Lake Tanganika in the First World War. When the Germans retreated from Kigoma in 2016 , her captain sank it to stop the British getting control of it. It lay in the bottom of the lake until 1924 when a British Royal Navy salvage team raised her and in 1927 she returned to service as Liemba. Its history since then is fascinating. I first heard about her from Dakin, a South African overlander that I had met in my first few days in Uganda. Right away it captured my imagination. Wouldn’t it be amazing to go on a ‘cruise’ on the last vessel of the German Imperial Navy still actively sailing anywhere in the world? Now, here I was, leaving one of its cabins to see what was happening outside. When I got out of the cabin the excitement of the other passengers was palpable, the sound of voices was becomig louder, everybody was pushing and shoving to find a good place to see people and goods embarking and disembarking and instructions were being shouted left and right whilst the golden flood lights of the ship illuminated the whole scene. Excitement was palpable in the air! Around us, in the water small canoes were receiving those leaving the ship and bringing goods for us to carry down the lake. I was ribbeted, witnessing this made me instantly forget how hard it had been the bike ride to get to Kigoma, the Tanzanian port from where she sails. I had crossed into Tanzania from Rwanda where I only stayed for a few days. 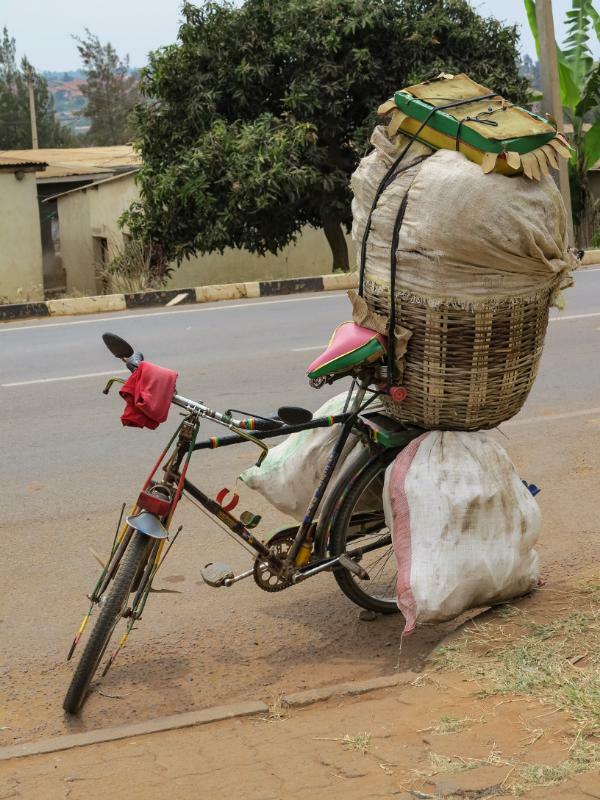 Rwanda is a country full of bike-taxis going up and down its many hills loaded with passengers. The passengers get off and walk when the hill is too steep for the taxi and then jump back on when it’s time to go down hill. 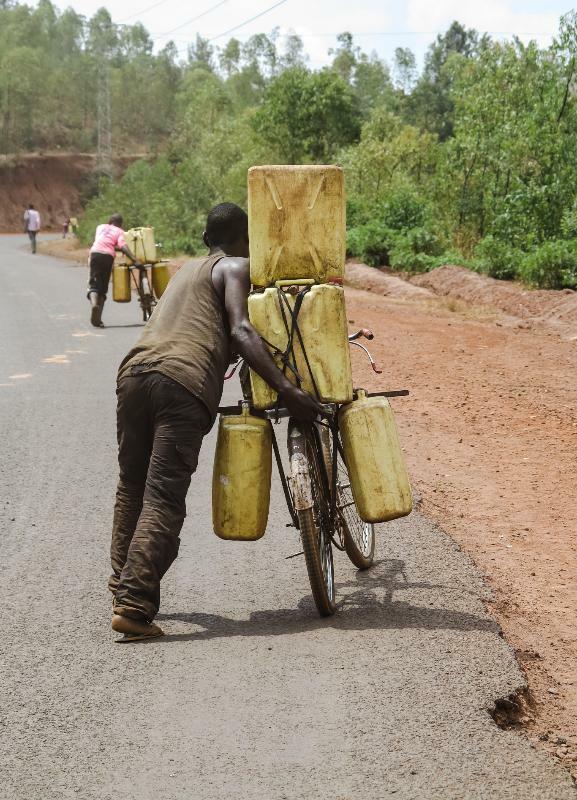 When they are not carrying people, the bikes don’t stay idle and they carry water or any other goods. No passengers so the seat sits on top of the goods! 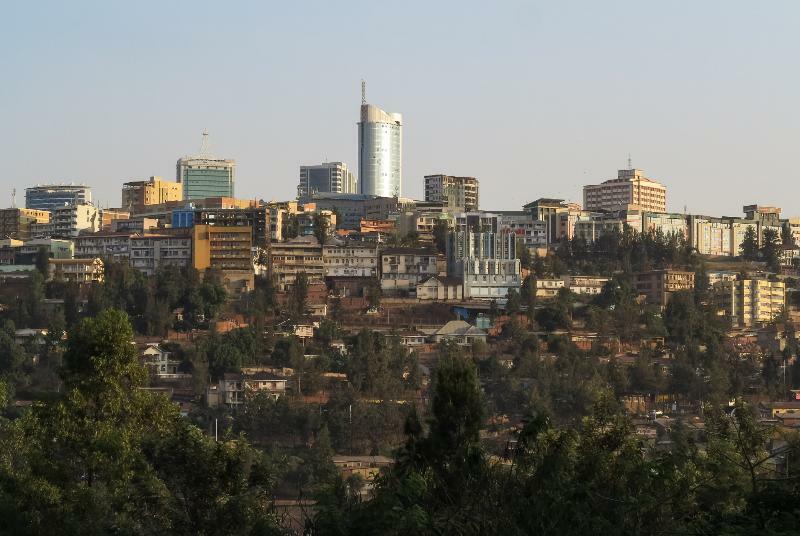 It didn’t take me long to get to Kigali, the capital, with its modern buildings and traditional cloth market. Rwanda has banned the import of second hand clothes to protect the local fabric industry. 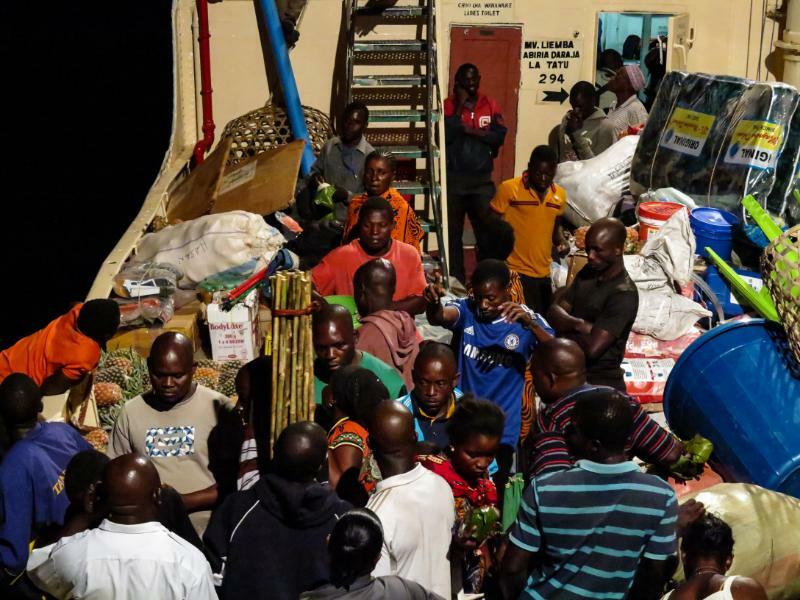 Other countries in the region tried that approach but the big foreign players didn’t want Africa to stop the huge imports of used clothes and accessories (Kenya alone imported 100 metric tons in 2015) and threatened to get the countries out of the African Growth Opportunity Act which grants duty free access to US markets for items like oil. Isn’t that a surprise!? 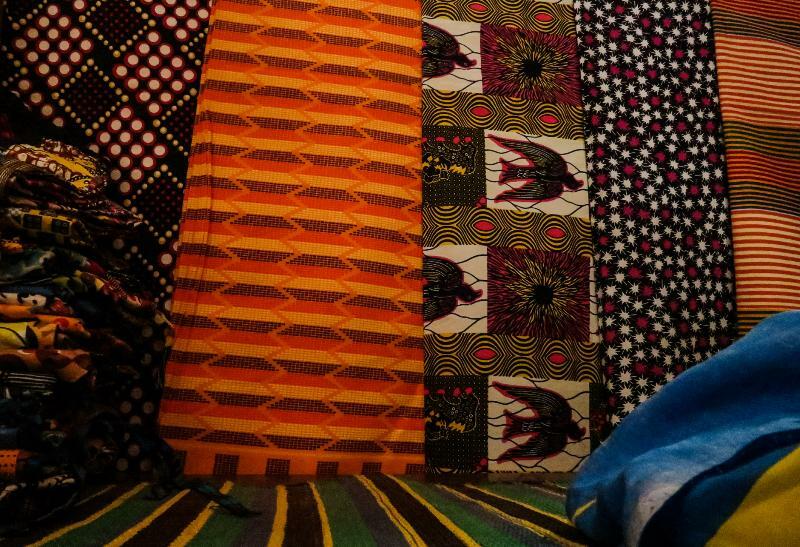 Out of four East African countries, only Rwanda stayed strong and maintained the ban and as a result, its markets are full of traditional fabrics and men and women sitting at old fashioned sowing machines creating all sorts of garnments. 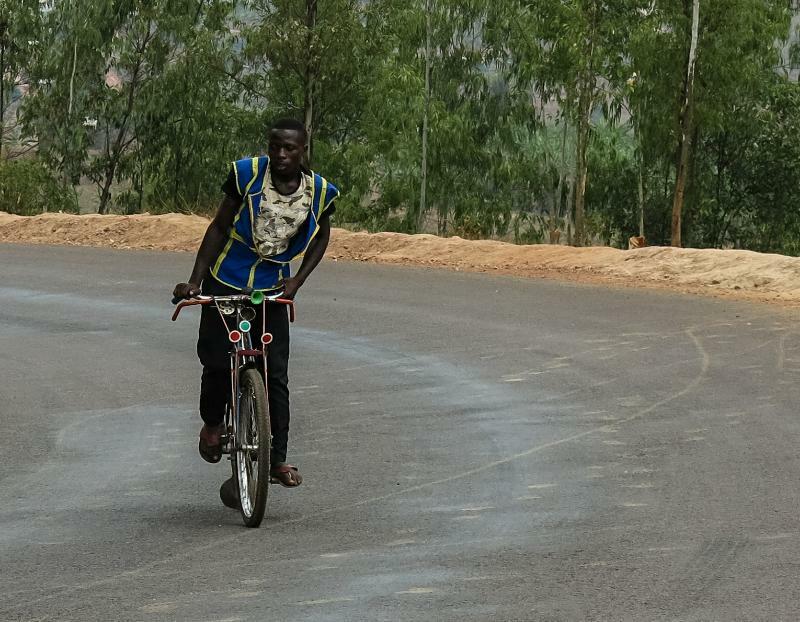 I stayed in Kigali for a few days enjoying the company of Desire and Inmaculate, the friendly hostel staff and making the best of fast Internet access. I hadn’t had a chance to back up my photos since Nairobi and who knows when there will be fast enough connection again. There is so much we take for granted at home – you open the tap and clean water you can drink comes out, flick the switch and the light goes on, go to the supermarket and find exactly what you want. On the road everything takes ages: filtering water, washing your clothes, looking for ingredients to cook…but if there is something I have plenty off nowadays is time, so all is well. 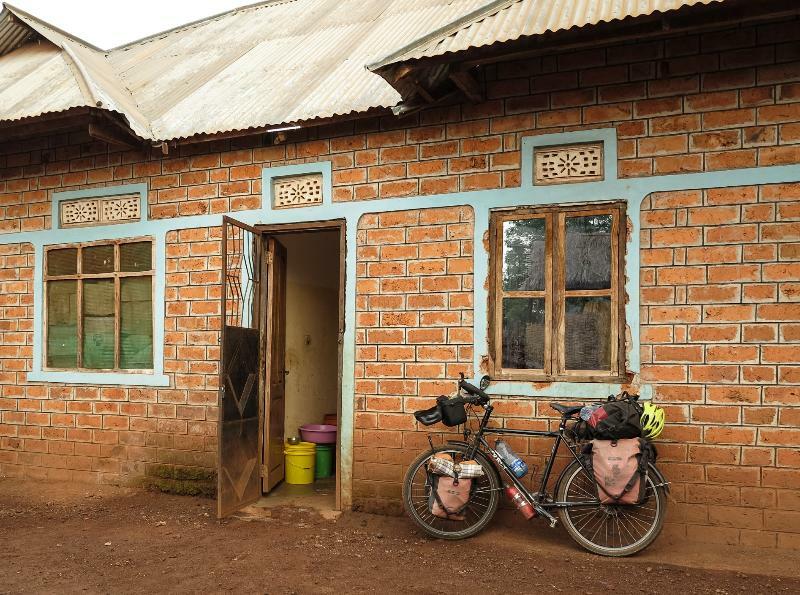 Eventually I peeled myself from the comfortable hostel in Kigali and began cycling towards the Tanzanian border. As in every country I have been, it is amusing to see how men on bicycles are truly put off when they see an older woman overtaking them or steadily climbing up hills without getting off the bike (never mind that I don’t carry the loads they do and my bike has wonderful gears). It happened each time – they just couldn’t bear to be overtaken by me! One particular man stuck in my mind. He was wearing red trainers and a red top and his red underpants where showing. I passed him climbing up a hill and he tried to catch up with me, overtaking me when I stopped to take some photos. I kept going slowly and he kept on looking back, his calves straining, their veins and muscles bulging. At one point he was zigzagging wildly across the road and kept looking back whilst I continued climbing at my snail’s pace. Around this time I began to get really annoyed with all the wolf whistling, all the heys and oys, all the cat calling I get from men as I cycle along. Such a difference from women who greet me or respond to my greetings in a dignified way. I decided to totally ignore their whistling, their heys and oys, their cat calling but they refused to be ignored and their calls got louder and louder and followed me as I cycled away from them. Some of the roots of my annoyance were in the injustice of seeing women and girls in every country always working – carrying wood and water, washing clothes and cooking outside their homes, looking after children, working in the fields, whilst men sat in the shade of trees and bus stands, or in bars and cafés talking and seeing the world go by. Watching tiny girls carry heavy buckets of water on their heads whilst grown up men looked on made me angry. Firm in my resolution I reached the Tanzania border. As soon as I crossed the border the roads became pretty poor. 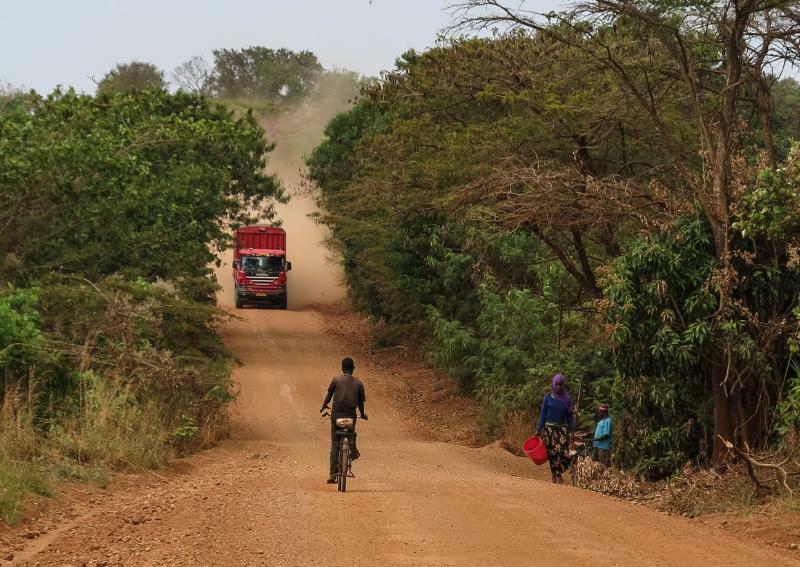 The road I had to follow to reach Kigoma and the Liemba was a red earth road going through a remote area in the west of the country. Washboards and sand became my daily companions making the cycling hard. Each time a vehicle went by I was enveloped by a cloud of dust that got into my eyes and my nostrils, caked my skin and stuck to hair. The road was kind to me though and at the end of each day, dirty and tired, I always found a place to sleep in the smallest of villages. The guesthouses where I stayed were very basic and more often than not I would set the tent on the bed to keep out unwelcomed creatures sharing the room with me. Every single day, I was grateful to have found a place and after having a bucket shower, cooking and eating dinner with what little I had left in my panniers and inside the safety of my tent-cacoon I had a wonderful night sleep. In this one rats and fleas were my companions! Slowly the vegetation changed and huge golden bamboos and palm trees replaced the low acacia shrubs found in the higher ground. 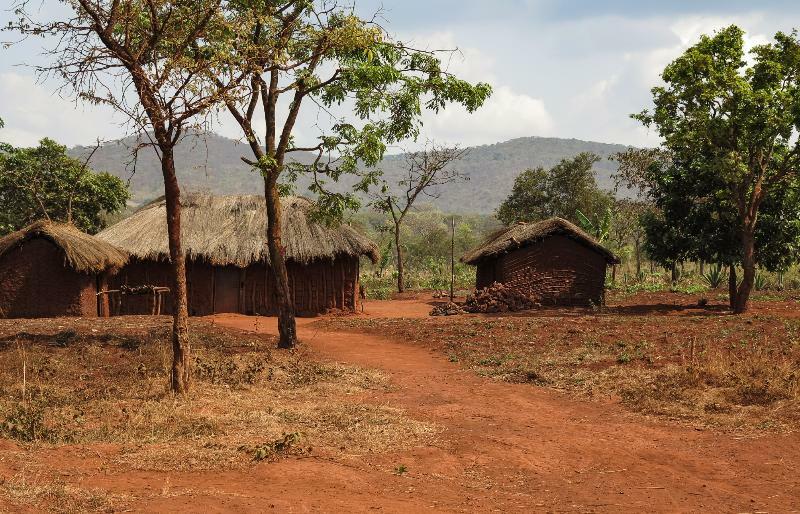 The huts in the villages didn’t change though, they continued to be small dwellings with corrugated iron or grass roofs and dozens of children around them that on seeing me would run to the road shouting “Mzungu, mzungu! 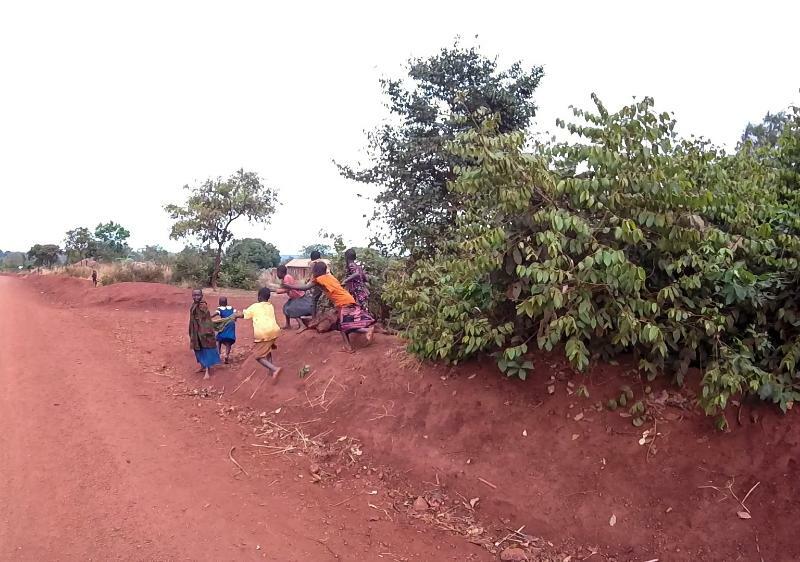 !” Like a Mexican wave “MZUNGUUUUU” followed me from hut to hut but if I stopped…if I stopped the children would run away in fear, the youngest crying and calling for their mothers. Children run away if I stopped! As I approached Kigoma what changed was the road, the red earth disapeared and grey tarmac replaced it. Without the red earth the villages suddenly felt less remote, it was as if I was back in the modern world and I hoped that the tarmac would bring an easier life for people in the region. The tarmaced road took me to Kigoma where I could have a few days rest before boarding the Liemba. And, as luck would have it, I was going to have company too. 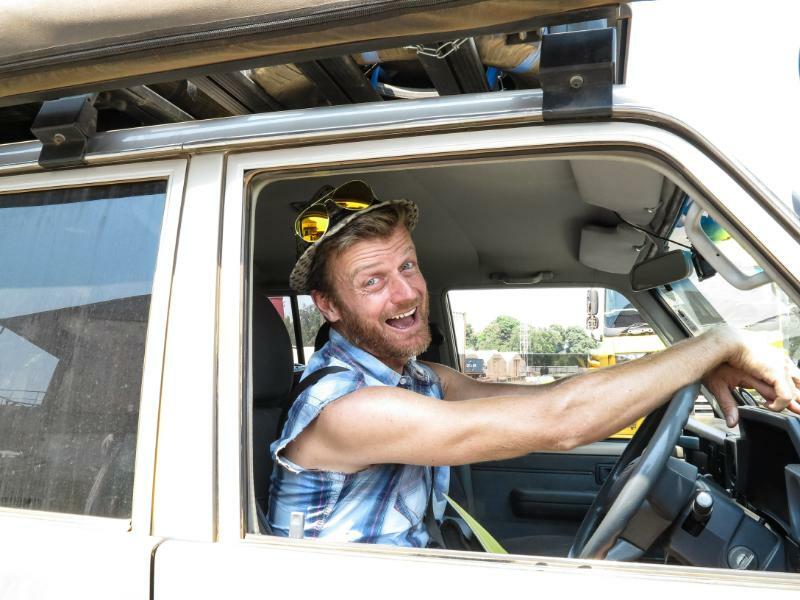 Dakin, that more than one month before, had told me about the Liemba had managed to get Viv, his Toyota Landcruiser, booked in the same sailing as me and we would be travelling together. It was nice having company. In the couple of days we had before setting off we cooked together, watched sunsets by the lake, went to the tailors, had a haircut (the second on the road) and tried to keep the vervet monkeys from stealing our food. Finally the day for departure arrived and from the platform by our first class cabin we watched anything and everything being loaded: hundreds of pineapples, avocados, tomatoes, flour, plasterboards, wicker baskets, jerrycans of fuel, soap, detergent, plastic chairs…The Liemba is the lifeline to the fishing communities that live in the shores of Lake Tanganika. Twice a month, it provides them with the only contact they have with the outside world. 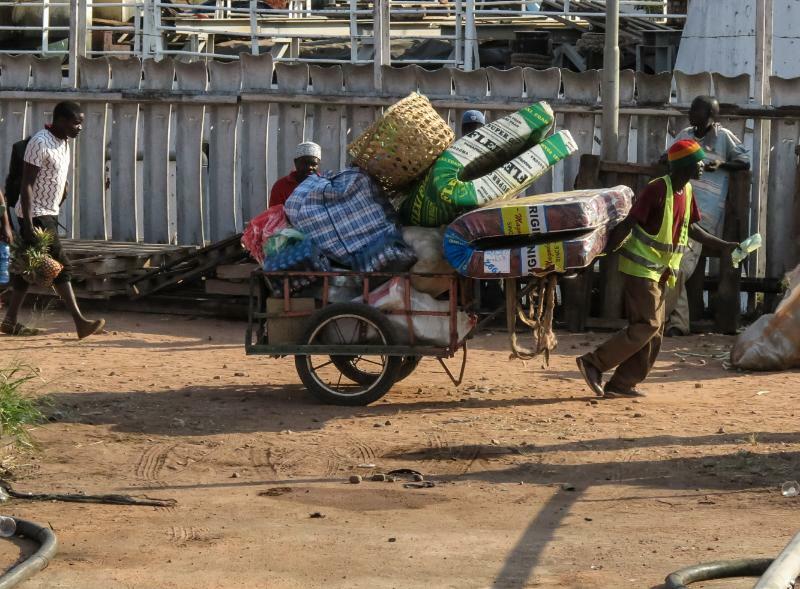 Not only it brings them things they need but by taking their bales of dry fish it gives them access to makets. After that first stop the Liemba stopped 13 more times before finally arriving at Kasanga, my final destination. 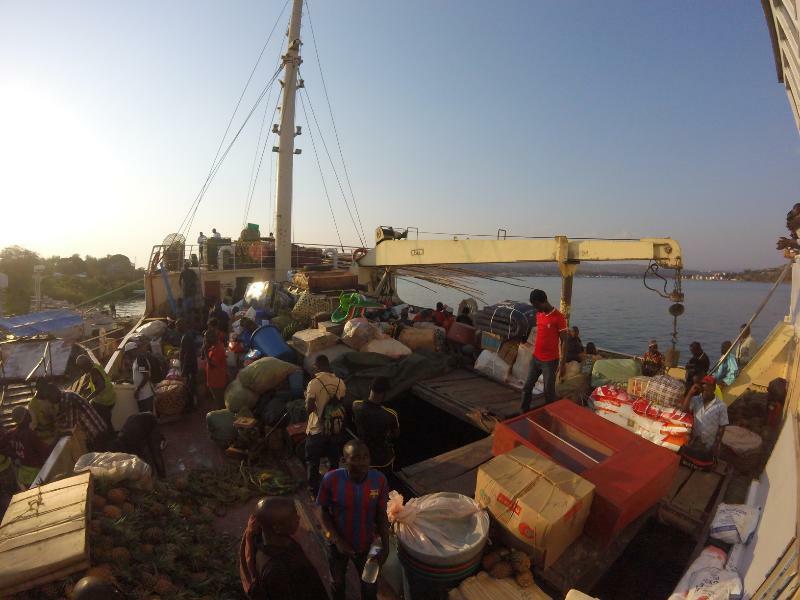 Each stop was as exciting as the fist one and after each stop the deck got a little bit more empty, the mountains of pineapples sold along the way to the fishermen that came to bring their fish and to take people ashore. Kasanga was another village lost in the middle of nowhere, the only difference between it and the others we had stopped at is that it has a road that links it to the outside world. A road I would take on my way to Malawi. It was time to say goodby to Dakin and take to the road. I was scared of black people when i was little. In first grade we had a Equatorian Guinea teacher and the first days we all were terrified. He ended up being the best teacher ever. i still remeber him and a sweet smile springs up to my face!! Me alegro mucho de que sigas disfrutando de tu periplo africano. 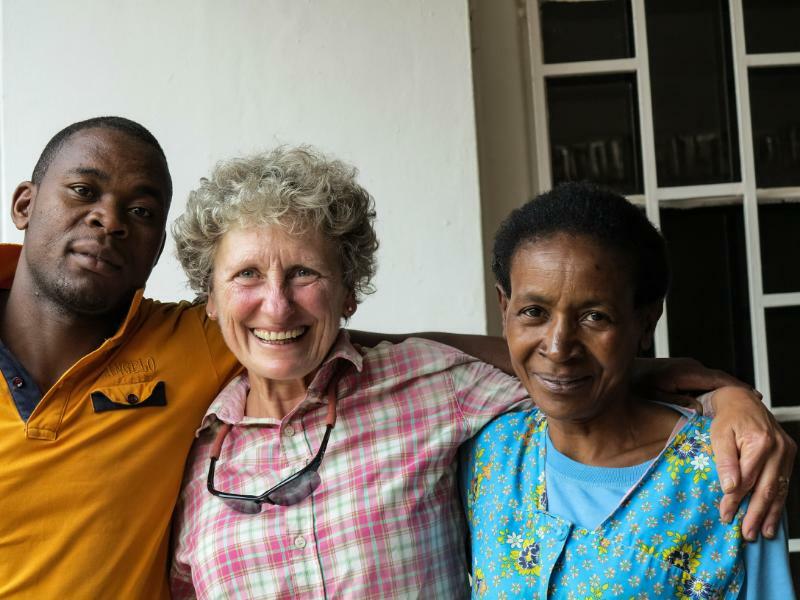 So happy Blanca you were able to catch the Leimba…it truly is a most authentic African experience. Love your commentary about Africa. Thanks for sharing your lovely story. 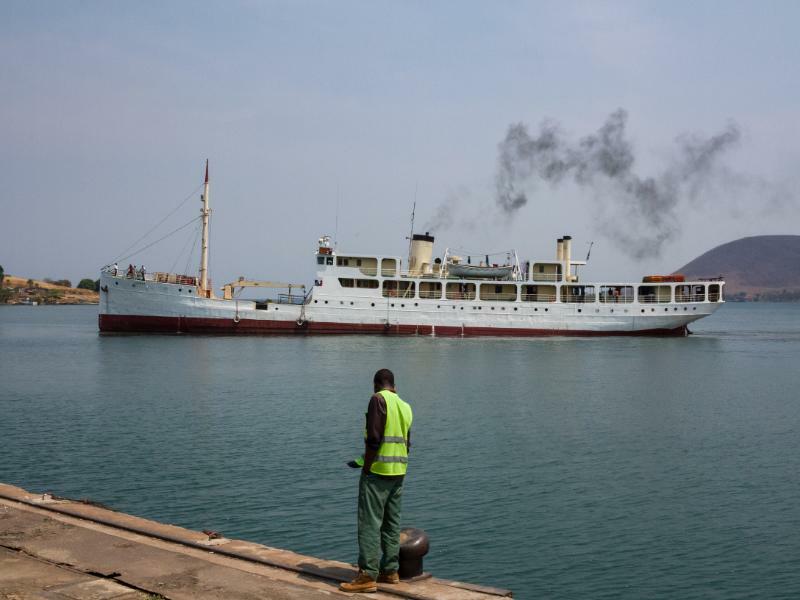 I am in DRC at the moment but planning a trip for Feb 19 specifically to catch the MV Liemba having read the book: Mimi and Toutou Go Forth (by Ben Foden). I am hoping to take the train from Dar to Kigoma. I cannot find anything on up-to-date sailing schedules and how to book. Can you help by and chance? The trip was absolutely amazing. The person to contact is anthony stephen Astem33@gmail.com. His phone number is +255 767 087 881. He used to be the boss at Kigoma but is not based there any longer, however he knows every thing there is to know about the schedules, etc. He was quite quick getting back to me but I can dig out his phone number if you would like to call him. Let me know if you want it. When I was there the ship left on Wednesday. A first class cabin cost 100USD. It has two births and shared toilets and showers which are not that clean. Cabin number 1 is the best because it has windows to the front and to the side. Second class is 90 USD and it is downstairs and there are 4 berths to a cabin and third class is hard benches and is 70USD. They charged me 10 USD for the bike that you pay directly to the captain. The ticket office only opens the Monday before the sailing on the Wednesday. I got off at Kasanga – the Liemba arrived on the evening but we were allowed to stay on board that night. Food and drink is available at the restaurant and quite reasonably priced. There are buses from Kasanga to Sumbawanga. If you are going to Sumbawanga, a good place to stay was the Moravian Church Accomodation (it’s in iOverlander if you use that app) Really good value for money but not the food. There is a restaurant on a side street near the Sky club which is excellent and for really nice brown bread go to Zam Zam bakery. Good luck and I hope you manage to get the info from Mr Stephen. It truly is an amazing experience. 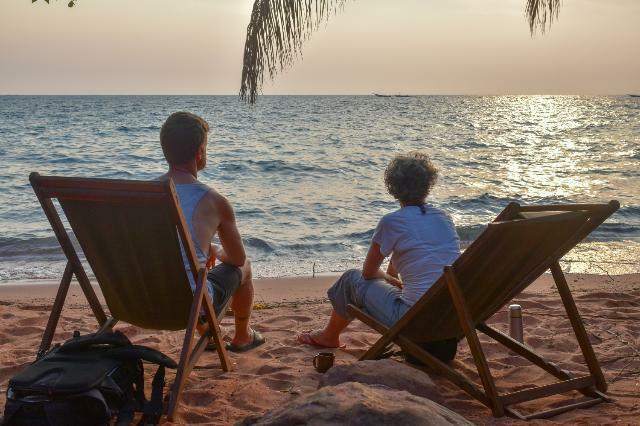 Hi Blanca, I loved reading this blog, I traveled on the Liemba in 2013, had tried the year before but got to Kigoma on the wrong week and didn’t have time to wait so traveled by bus to Sumbawanga via Mpanda. 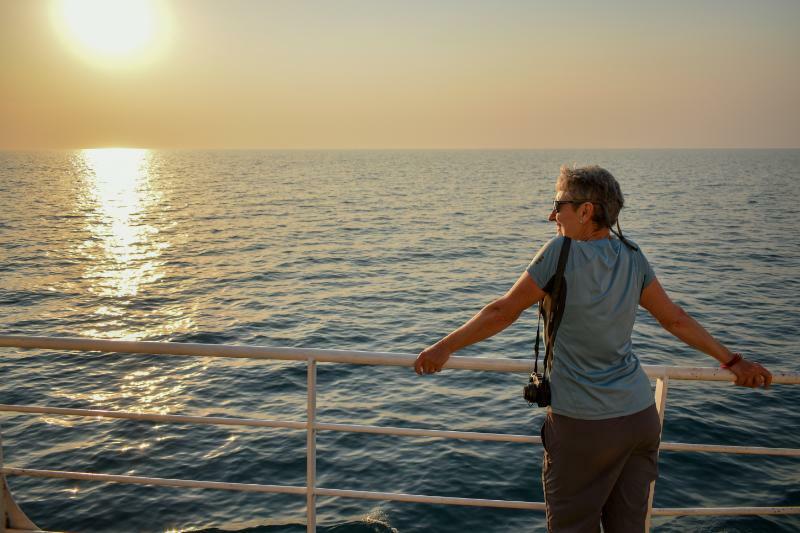 I loved every minute on board the boat and it is memory I will always treasure. Did you get time to visit Kalambo Falls while you were in Kasanga? Only just found yor web site and look forward to reading ore about your wonderful adventures. i can t wait for your coming to talk to my students and tell them all about your wonderful adventures….I m sure they’ll be as curious as the ones you met on your way….BIG hugs, dear,dear friend!! Another informative and evocative post Blanca. Your ‘cruise’ looks wonderful. It must be so interesting to witness how trading takes place in this remote area. It’s also great to hear that Rwanda has resisted the importation of second hand clothes from the West, the local fabrics look wonderful! 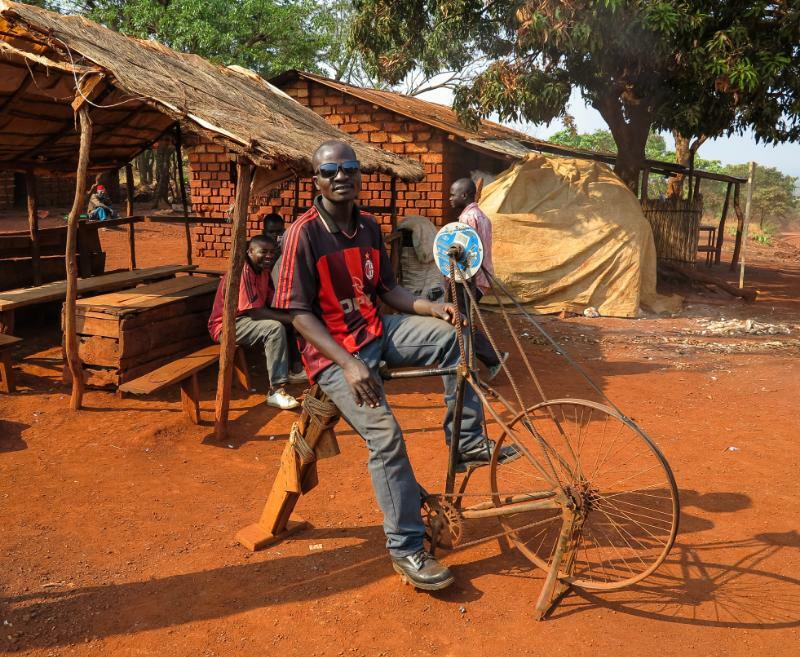 Enjoy your ride to Malawi! So enjoyed your account of your amazing travels, Blanca. Makes me want to turn around and go sail on the lake. What an amazing adventure and cannot wait to read the next installment. What a wonderful thing to do…cycling to do this particular ‘cruise’. Love reading the history of the boat. The pictures are fab and really capture your experience. I love reading about the people you meet along the way too and their stories. How amazing to have time to follow what captures your imagination. I love reading your updates! You are so inspiring Blanca! What a fantastic description again! I looked up this German vessel ‘Graf von Götzen’ and found out that it was the inspiration for the movie ‘The African Queen’ with Humphrey Bogart and Catherine Hepburn. This makes tour cruise even more romantic! What a pleasure it is to read you again and so interesting … I am quite upset to learn that, again, some big foreign companies are imposing their threatening rules on, this time, clothes market in african countries ! I can’t wait to read you again. 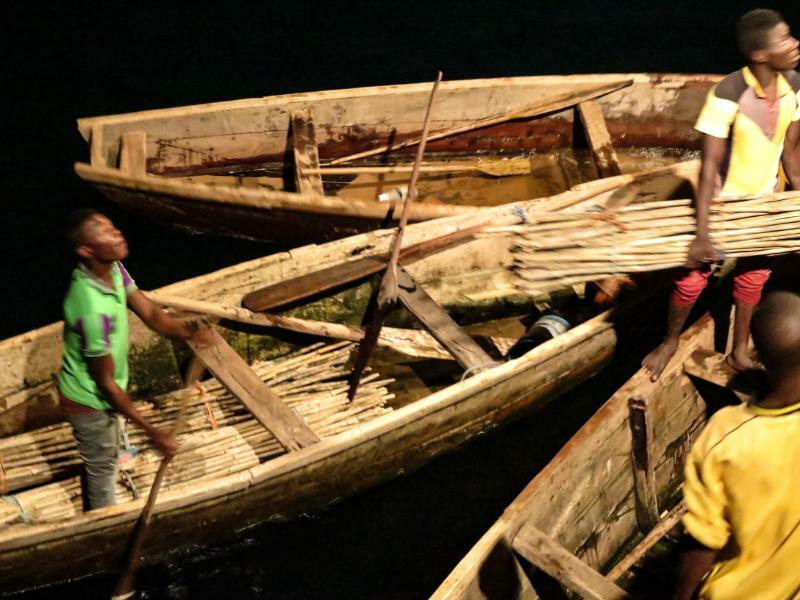 Wow, I was completely transported to Lake Tanganika by this blog Blanca. Fantastic, thank you. Nice to read you and to see that your trip goes on. You may remember that we met in Nanyuki close to Mount Kenya. All the best to Y Blanca, Peddle on, I am to lazy so I take the Dala-dala. I will never forget how Y prepared lunch for us on MV Liemba. Sorry it took me so long time to answer Y`r mail (which I have not done yet). Thanks for the photos Y sent. It was great to get to know Y.